When I was in high school in Pensacola, my only ambition was to get out. I wanted to see the world, live in a big city and become a respected reporter. Five years later, my goals haven’t changed much but I have a different outlook on how to achieve them, and after living in Miami, I realized a “big city” is different than what I originally thought. To rewind, please read my story Big City Shock which is a first-person narrative of my first day in Miami. I’m going to admit, I first couple of years there were a struggle. I contemplated moving up the state, closer to the South, a place I was familiar with, a place where I fit in and didn’t get made fun of for saying the word, “y’all.” My sophomore year, I visited Gainesville and debated switching over and finishing up my journalism degree at the University of Florida. My gut instinct told me to stick with Miami, and I’m glad I did. As a small town girl I probably wouldn’t have ever been exposed to other cultures, languages food or ways of life. Miami taught me to expand my views of the world, to cease opportunity and to tolerate people who are literally from a different country. These are all things that are a bit harder when you come from a place with limited diversity. As far as education, University of Florida may have had a better academic reputation than Florida International University, but, living in a big city I was able to work for a true Metropolitan newspaper, The Miami Herald. By living in a place that was overflowing with news, I was able to gain experience in a fast-paced environment. I used the real-life newsroom as a classroom, and living in a small-town I probably wouldn’t have gotten that opportunity. My point is, if I had changed my mind and gone to a school in a smaller town upstate, I wouldn’t have grown as much as a person as I did. My advice to any undergraduate or graduate student is to attend at least one school in a place different than your hometown, if possible. The uneasy feeling can be channeled into adventure and lead you down avenues of opportunity you never thought you’d have access too. 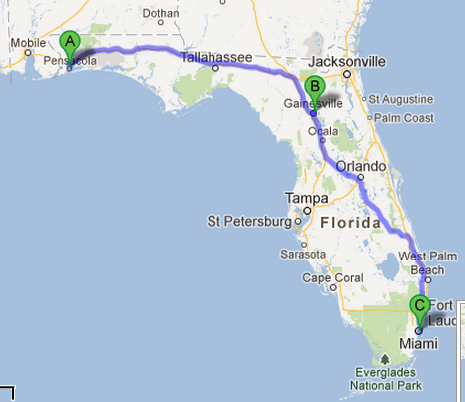 After Miami, I was ready to go back to the familiar for a while and go to the University of Florida. To my surprise, there was more diversity here than what I expected, and I love the scholarly atmosphere of the college town. Here, the town revolves around the college, which is a sharp contrast to Miami. I’ve only been here about two weeks so I will post more as time goes by. For now, I am in my first semester as a Master’s student pursuing a degree in science/health communication. I currently am working as a graduate assistant, where I use social media to promote the new Master’s degree in web design for the school of journalism. I will be posting my research as I start to narrow down my thesis options, and if you’re a science communications nerd, follow along! I will also be revamping the website at some point to get this thing going as a true science media site.